When living in the Blue Mountains last century, we often made pilgrimages to Sid Cadwell’s Boongala nursery at Annangrove near Windsor. Sid’s nursery was well-stocked with a wide and interesting range of native plants. The nursery was surrounded by a large garden that bulged at seams with native plants. We often spied specimens that we did not recognise. Sid was always ready with information about the relevant plant. Once Sid realised that you were as passionate about native plants as he was, then not only was he generous with information but also with cutting material from his garden. Thanks to Sid’s generosity this was how we first acquired Melaleuca violacea. Melaleuca violacea is a native of Western Australia and is a small shrub, reaching a height of less one metre with a spread of 1.5 metres. This species has layered branches that form an interesting flat top. The small leaves are heart-shaped and less than one centimetre long. Mauve-purple flowers are carried in lateral or axillary clusters during spring. The clusters are small but what the blooms lack in size they make up for in quantity. During the flowering period the stems are covered in flowers. Both flowers and the distinctive growth habit are eye-catching features. 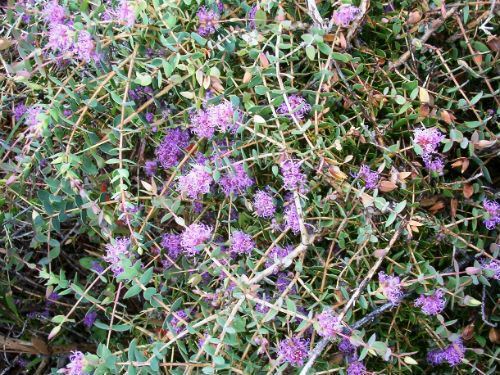 Melaleuca violacea could be grown as a mounded ground cover in rockeries and native cottage gardens. The species would not look out of place in a Japanese-style garden. During a roadside stop, on a coach tour in Western Australia, we found populations of Melaleuca violacea colonising roadside verges. The type specimen was named in 1844 from material collected near Albany, Western Australia.